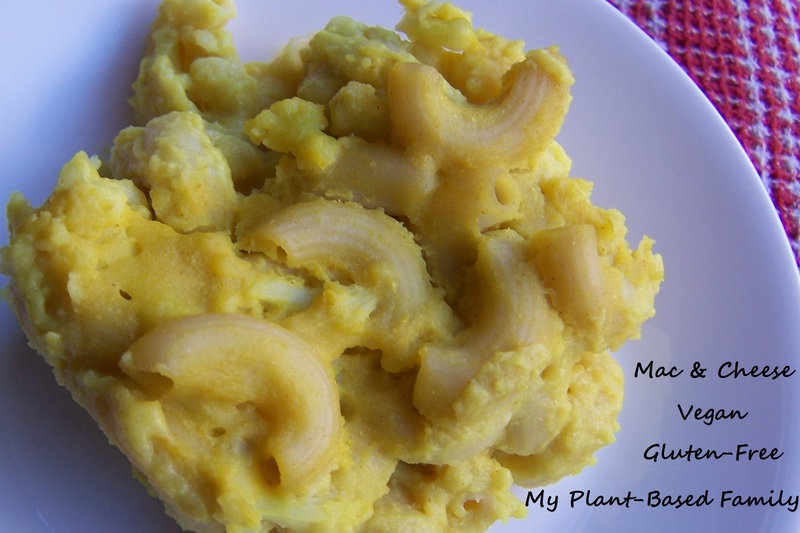 I’ve been wanting to make a gluten-free, dairy-free Mac & Cheese that is actually healthy. Now that I have I’m already thinking of other ideas to spice it up. I plan to serve this at my next Healthy Craving group. If you aren’t concerned with gluten you can use regular whole wheat pasta. Cook noodles according to package directions. Cauliflower can be steamed separately or cooked with the noodles. Mash potatoes, adding water until a smooth texture is reached. Pour noodles and cauliflower into an 8×8 casserole dish. Add potatoes to the prepared cheese sauce and whisk well. Pour cheese sauce into noodles and gently stir until noodles are well coated. This looks like very involved dish but it really isn’t that hard. The most difficult part for me is paying attention to the cheese sauce that needs to be whisked continuously. I served this alone but it could easily be a side dish. While we enjoyed this if you are still hooked on regular ol’ dairy filled mac and cheese you may not be ready for this. It definitely tastes like nutritional yeast. My two-year old loved it. He had 3 servings! I’ve never been a big mac and cheese fan but I liked it too. I wouldn’t try to pull a switcheroo on my teenagers but if you are raising plant-based kids give this a try, they may just find a new favorite. This kid was really trying to take over my photo shoot. He is pretty hard to resist! Do you miss Mac & Cheese or have you found an acceptable version since changing your diet? We are die-hard “thick-and-creamy” boxed mac-n-cheese fans. I don’t eat it very much anymore for obvious reasons but if I try anything veering from what my kids are used to, they won’t eat it. And, frankly, the few vegan mac-n-cheese recipes I’ve tried have made me cry out in palatable pain, wanting to fling my dish across the room shouting, “Why have you betrayed me? !” I’m not sure I’d like this, but I admit I’m curious as to its flavor. I wish I could be there for your next Healthy Cravings mtg! Looks easy enough… I’ll see if I can work it into my next meal planning rotation. Joye, I’m not sure how long you’ve been off of dairy but I’d hold off on the fake cheese for at least a few month. It’s not the same as dairy but once you’ve kissed dairy goodbye this is a nice treat. Once you are off the dirty dairy for a while, nutritional yeast is so so deliciously addictive. I swear, there is really no better food in the world than mac and cheez!! This recipe is a favorite at our little Chabad House on the Wadi! Holly Yzquierdo of My Plant-Based Family is a participant in the Amazon Services LLC Associates Program, an affiliate advertising program designed to provide a means for sites to earn advertising fees by advertising and linking to amazon.com.